Be sure the root flare is near the root ball surface (top left). 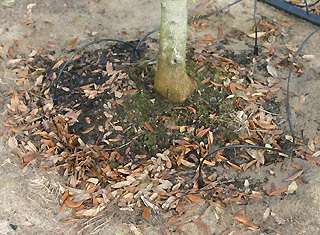 position the root flare about even with or slightly above the landscape soil (top right). 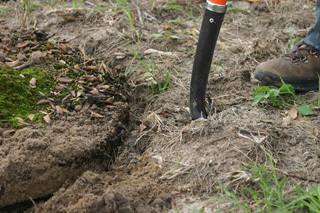 Backfill by slicing a shovel into the soil surrounding the root ball and pushing it in the hole (bottom left). 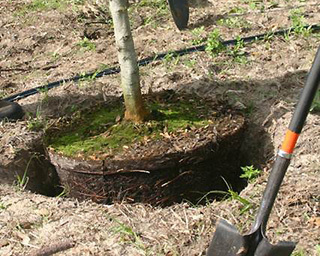 Once backfill is filled in and lightly tamped with your foot, clean off any soil that has accumulated over the root ball (bottom right). 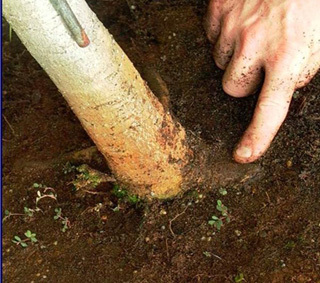 Be sure the surface of the root ball is visible. Mulch can now be applied to the soil around the root ball.